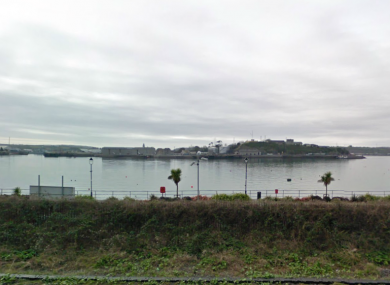 The dump at the former Irish Steel plant at Haulbowline Island – featuring toxic waste – is to be cleaned up by 2014. Haulbowline Island has been the site of a dump for decades, created while the Irish Steel plant was based there. THE GOVERNMENT is to undertake a major clean-up operation of a dump in Cork Harbour which holds significant amounts of toxic waste. The dump – in an open mine on the island – has been open to the elements ever since the steel plant shut down in 2001, and had recently begun to be impacted by waters rushing in and out of it at high tide. The current contents of the dump are not known for sure, due to the removal of some unitemised contaminant in recent years, but it is possible that the dump may have housed some heavy metals due to the presence of the steel foundry. The government has now committed to a clean-up of the dump by 2014, after facing pressure from the European Commission which had threatened to fine Ireland for not addressing it. The clean-up – to be overseen by local minister Simon Coveney – is set to cost around €40m, according to RTÉ News. Mary O’Leary of the CHASE Ireland group, which had been campaigning for a clean-up of the harbour, told TheJournal.ie that the working group to oversee the clean-up operation had included community representatives including herself. “We’re very happy that funding has been made available for it – at last, an Irish government is taking the problem seriously,” she said. Planning permission for the clean-up will now be sought, with the organisers of the clean-up saying they hoped the licence to be granted would be thorough and take account of the concerns of the local community. The clean-up is not likely to see all of the offending materials removed, but rather contained and sealed so that they do not pose a major threat to the further environs of the harbour. Email “Threats of EU fine prompts clean-up of toxic Cork dump”. Feedback on “Threats of EU fine prompts clean-up of toxic Cork dump”.